Godzilla (2014): Dir. Gareth Edwards. Written by Max Borenstein, from a story by Dave Callaham. Based upon the franchise of the same name owned by Toho. Starring: Aaron Taylor-Johnson, Bryan Cranston, Ken Watanabe, Elizabeth Olsen, and Davis Strathairn. Rated PG-13 for intense sequences of destruction, mayhem and creature violence. Running time: 123 minutes. “It was just what I expected.” That was my answer to my friend’s question, “What did you think?” And usually that would be enough for a giant monster movie. The problem was, I hadn’t expected much. I wish I could say this was a terrible movie, or a good movie, anything but the giant “meh” that it was. I may not have expected much in the ways of things I typically enjoy about the movies—oh you know, writing, acting, visual poetry, things of that ilk. But Gareth Edwards’s recent take on the movie monster commits a cardinal sin: it lacks a sense of wonder. Or fear. Instead, it substitutes blandness. Meet our resident Bland, Ford Brody, played by the usually reliable Aaron Taylor-Johnson. Find him uninteresting? Lacking in human feeling or affectation? Great! You get to spend 99% of the movie with him. After long dormant monsters rise from the depths of the earth to wreak havoc on the earth, Ford embarks on mission of the fly-by-the-seat-of-his-pants variety. One minute he’s trying to find his family, next he’s joining a special forces team to combat the monster menace. While Ford is out doing the cool stuff, his wife Elle (Elizabeth Olsen) and son Sam (Carson Bolde) languish in San Francisco. Their roles largely consist of them looking scared and adorable. That gets at another huge miscalculation of the film—it makes focuses a great deal of its time on the human characters, while failing to provide them with anything interesting to do. We get exposition, exposition, exposition. The family moments are cheap and manufactured, as if laughing together is a substitute for any sense of human connection. At least Bryan Cranston as Ford’s dad provides some much-needed anguish, perhaps because he’s given the Big Important Monologue early on. But enough about that crap—you came for the monsters, right? Well, here the filmmakers redeem themselves—at least in part. Clearly the special effects team has labored long and hard to bring these creatures to life—certainly more realistic than anything Toho could have comprehended in the 1950’s. The image of Godzilla vomiting his radioactive breath into another monster’s mouth remains the hallmark of a mostly unremarkable fight. (Though I was strangely reminded of John Coffey’s evil-vomiting power from The Green Mile). But there’s predictability to the design; you feel like you’ve seen them before. Expensive, yes—but where’s the personality? Special effects need not put a damper on monster design, as we saw with Wayne Barlowe’s impressive work in James Cameron’s Avatar. Here, it all feels like borrowed parts. Godzilla looks like what you’d expect, though he may have to burn some calories if he’s planning to “restore balance” anytime soon. What plot we have comes across as unnecessarily convoluted and silly. The military treats this radically new threat like a job of the week. It’s the same military conglomerate we’ve seen portrayed in every blockbuster film, which may explain why David Strathairn as Admiral Stenz looks so bored. And don’t get me started on the nuclear weapons that they seemingly transport willy-nilly. I still don’t quite understand why the military felt the need to transport a nuclear weapon by train; apparently director Edwards felt the need to recreate the famous scene from The Bridge on the River Kwai. As a piece of film-making, Godzilla is competently made—but that’s just the problem. It’s purely competent. It lacks a personal stamp from Edwards, settling for all things formula. Not to mention it squanders a great cast, one that would have been better-suited to the latest Woody Allen film than a blockbuster monster movie. 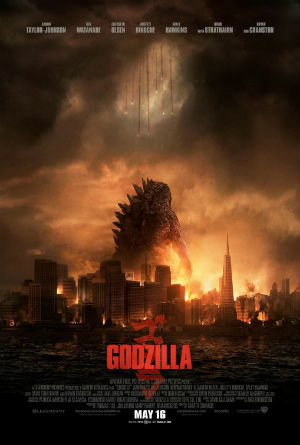 Films like Godzilla are the reason I stick to the art-house.